The idea of a Land Art symposium for children came during last year’s Land Art Symposium ‘Pura Natura’ hosted by the campsite Sotto il Faggio and organized by Carla Cremers and Tegi Canfari. Led by Claudia Borgna and inspired by the artworks created during that occasion, the children of the campsite from observers and assistants became artists themselves. So why not create an official ‘Kids’ Land Art symposium where kids can express their own vision of how to relate to our/their natural environment? Experimental and open to improvisation, the fundamental concept of this project aims at a creative experience harmonious with the marvellous nature of the Maritime Alps. Agnese and Gian Luca Scapin have invited Claudia Borgna to be the artist in residence at the camping site Sotto il Faggio. During the first week of August, Claudia will assist youngsters staying at the campsite apply their creative creative abilities, whether observational, philosophical, analytical, manual or practical. Natural materials foraged on site will be transformed by the children into temporary site-specific en plein-air sculptures. 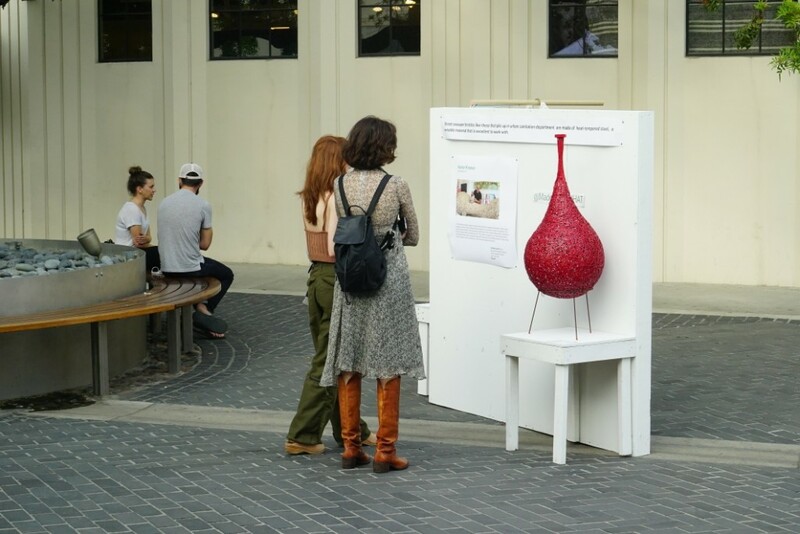 A final presentation open to the public will narrate their shared creative adventure. By becoming responsible interdependent active subjects, the children will educate us adults to set the missing example of how the world should really be! Culture and nature, not separate and conflicting but rather harmonious, and above all interdependent entities. This space dedicated to the most majestic and trustworthy teacher, will celebrate nature and the new generations that it will host. I thank the Campsite Sotto il Faggio for once again so generously and bravely opening up their space to art and culture. An alternative to traditional mainstream art circuits, this experience will hopefully bring culture a step closer to nature: we have a long way to go. An art Critique for a porfessional flowers arrangement class, that is how Marisa and I spent the most lovely afternoon talking art and making a delightful bouquet. While I gave her feedback on her artwork she taught me how to make a professional floral composition. The aim of this project is to set throughout the camping site a series of sound sculptures that will all come together into a final Drum Circle performance. Coined by 60’ USA counterculture, Drum Circles are informal music gatherings inclusive of all types of instruments and free of hierarchical systems. Offering a rare space of equality and freedom their rhythm seek a group consciousness that is in harmony with one another, with ourselves and in this case with the surrounding natural environment. Ephemeral sculptures, the musical instruments will be inspired by the local flora and fauna and built with natural materials collected on the campsite. The making process will hopefully challenge us to discover, invent and experiment with shapes and materials, with our imagination, and with sounds that might well be new to us or perhaps different from known musical instruments. 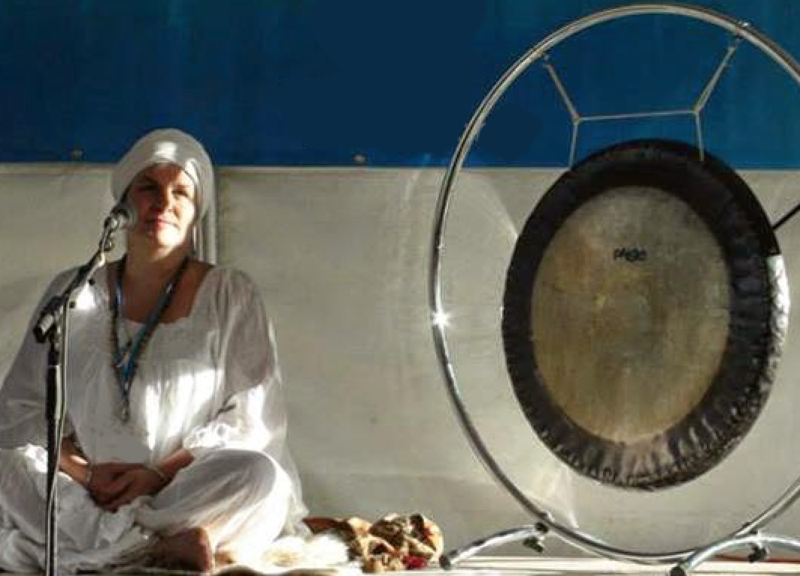 The Drum Circle’s performance will bring everybody together into final sensory experience that voices the kids’ creativity while connecting environmental, cultural and sensorial bodies in a sort of collective spiritual magnetic resonance. 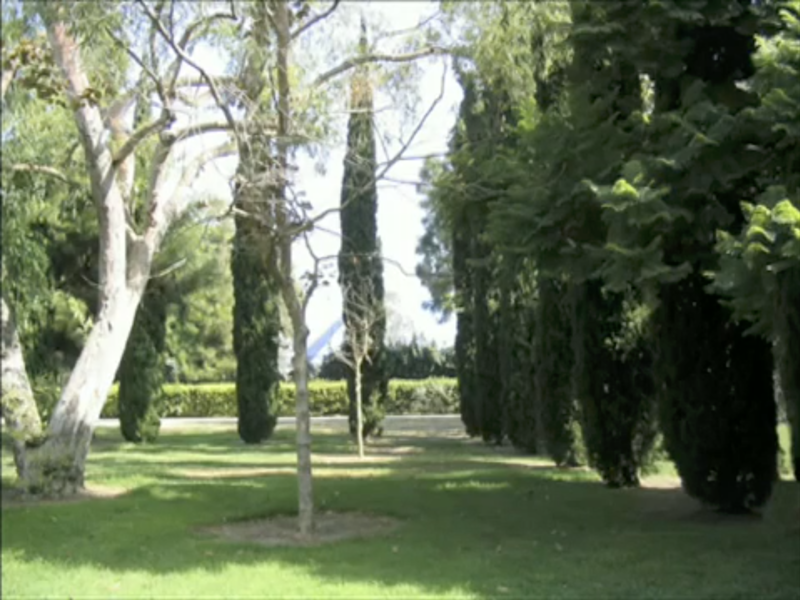 Frederick Fisher, Room (1993), Cypress and plum trees, West lawn: 600″ x 70″, South lawn: 163″, CSULB Outdoor Sculpture Collection. Founding UAM Director Connie Glenn selected Maren Hassinger, Frederick Fisher, and Eugenia Butler to participate in a series of interdisciplinary collaborations centered around the museum’s new site, which was built in 1993. 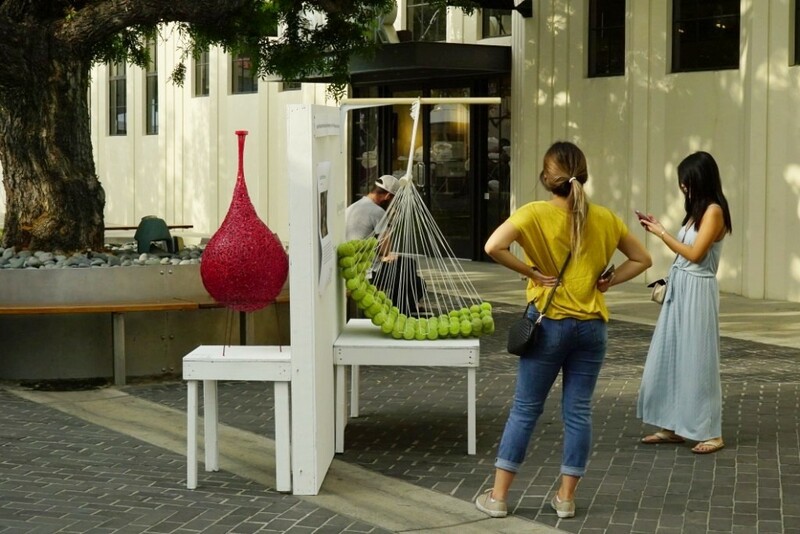 The three public art projects of InSite/Centric were the result of the sculptor, architect, and conceptual artist’s respective residencies of the summer, fall, and winter of the same year. A charming UAM catalogue called Reconfiguring Boundaries/Opening Spaces documented the special projects and compiled scholarly essays and artist interviews. Hassinger installed Evening Shadows, Butler built Lover’s Bench for a New Millennium, and Fisher created Room. These artworks have adorned the sculpture garden that surrounds the museum ever since. Five plum trees stand in a line at a slight angle toward the southwest. Their leaves flicker in the wind and, brushed by sunlight, their color changes from deep brown to a luminous red orange as the light glows through the translucent leaf fabric. Opposite the plum trees and extending beyond their span, stands a rigid row of five Italian cypress trees. Perpendicular to these two boundaries is a second line of six more cypress trees to form the northeast corner. On the south side of the museum, beyond view, a line of four additional cypresses planted parallel to the building, serves as the “entry hall” for the “room” to the west. This outdoor living room defines and delineates a contemplative space as well as providing a means to assimilate the disparate elements of the landscape and to view them as a total composition. This raises aesthetic and philosophical issues concerning what has become known as public or site-specific art. Encountering the lines of trees that slowly reveal themselves as design elements, the viewer is surprised into seeing the entire garden as sculpture. While respecting the integrity of the materials, they are manipulated to achieve relationships that communicate visual intent while retaining the unique and inherent qualities of each. The cypress and plum trees of “room” are deliberately placed so that each tree reveals its intrinsic beauty while still contributing to the whole. Join us for space activation, tours of the sculpture collection, and artist performances. Come early and picnic on the grass with friends and family, inside Frederick Fisher’s Room (1993), before primary activities begin. Claudia Borgna, an internationally recognized performance artist, will activate Eugenia Butler’s Lover’s Bench for a New Millennium (1993). Nicola Lee, sculptor and performance artist (CSULB School of Art MFA, Sculpture), will activate Maren Hassinger’s Evening Shadows (1993). Chris Velez (CSULB School of Art BFA, Sculpture), will utilize everyday movements to create sculptures on the body in his activation of Guy Dill’s In Irons (1974). Yoga class led by Raghubir Kintisch (pictured above) will activate Frederick Fisher’s Room (1993). Bring a mat or blanket, and dress comfortably. This gentle restorative class ends with a mindful meditation. The invention of plastic in the fifties was an incredible and very practical innovation. However, its excessive use and the problems associated with managing the waste coupled with the rather unscrupulous and mercenary behaviours of individuals and manufacturers, means that today it is one of the largest polluters of the planet and the oceans. Yes, it’s urgent that we act quickly! To contain this environmental disaster, we also need to find alternative and sustainable management solutions to handle what will certainly be a long and painful transition. 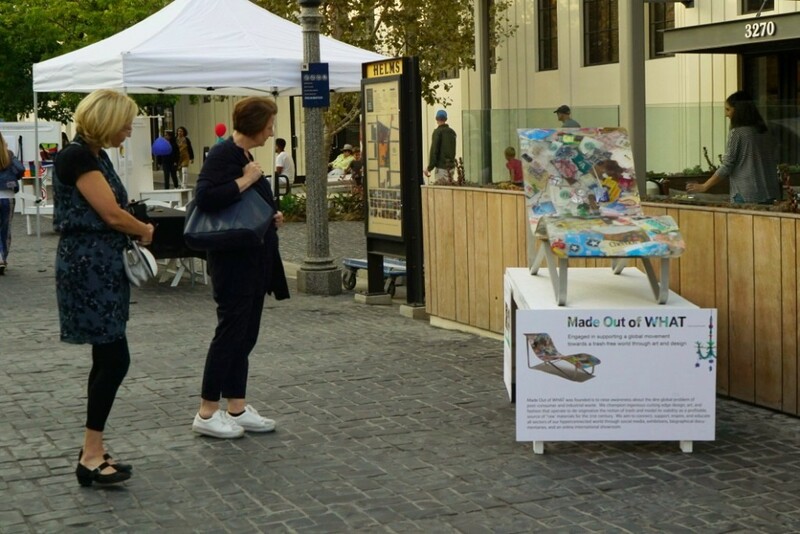 During its 1st odyssey in 2015, the Foundation’s teams observed that unlike other recyclable waste, like aluminium, no one was collecting up plastics due to not being able to sell them on. As such, they sought a way to give it value. After three years of research and in collaboration with the French company ETIA, the Foundation developed a machine capable of converting plastic waste into electricity. 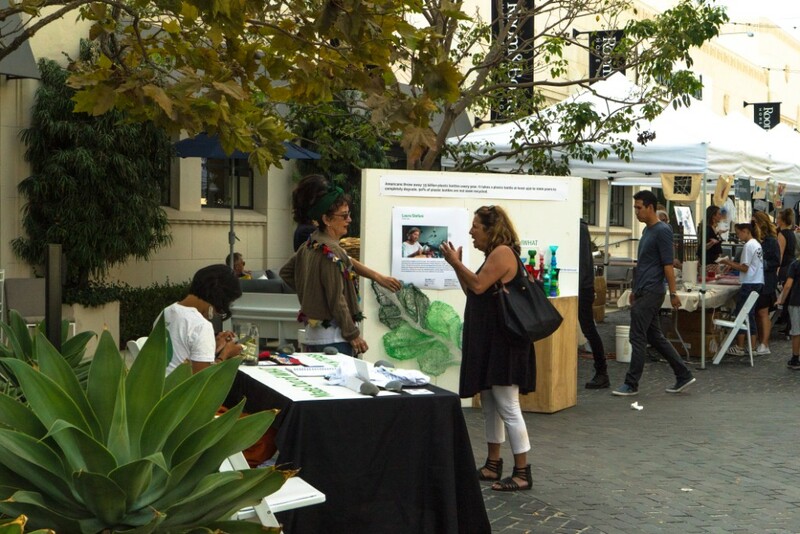 In this way, Race for Water is offering a local response to a global problem. Here is a recap if you missed the fun and excitement of the day! 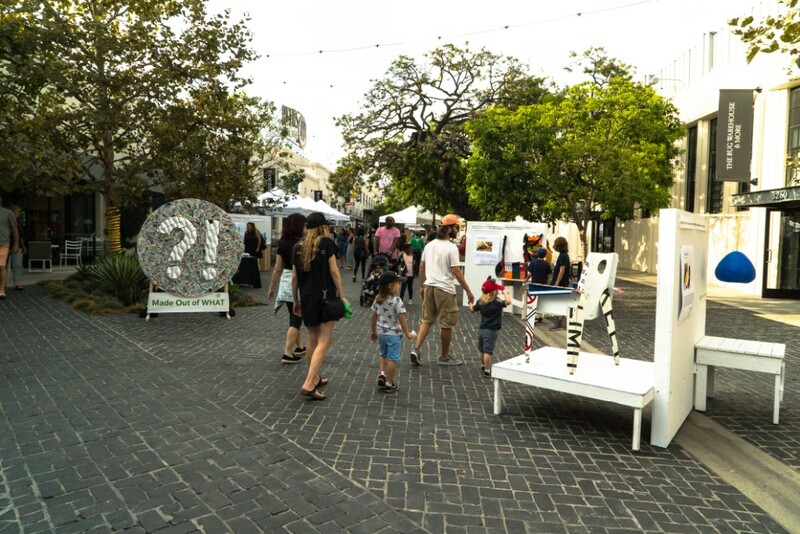 Saturday’s Art Walk at the Helms Bakery, with its over seven thousand visitors, was replete with entranced children and fascinated adults. Helms Walk was abuzz with impassioned conversations around solutions to the existential crisis of trash. Art enthusiasts gleaned inspiration from Garth Britzman’s ingenious Tennis Swing. His work proved an excellent photo op for Instagram. Made Out of WHAT founder, Denise Domergue, left, discussed its mission and practices. Behind them, Italian artist Laura Stefani’s delicate and colorful wall piece elicited awe as viewers discovered that the finely woven mesh was made of thin strips of plastic bottles cut with manicure scissors. Designer, Lisa Staugaard, learns about artist Aaron Kramer as she reads his bio and facts about street sweeper bristles. 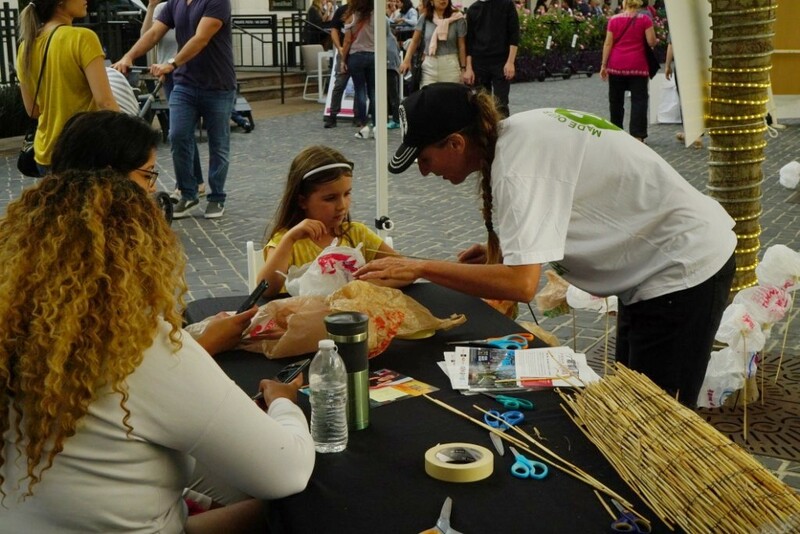 Renowned international artist Claudia Borgna taught countless excited comers of all ages how to turn a plastic bag into a flower at our free interactive installation workshop. 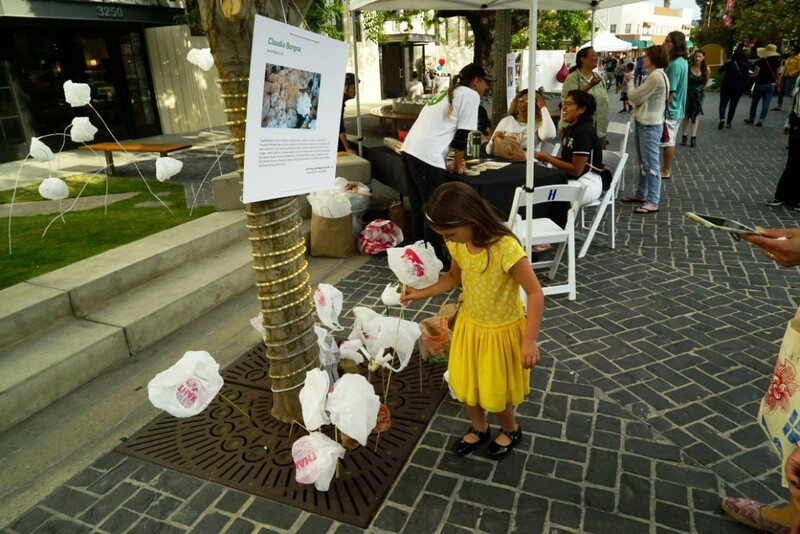 While some participants chose to take their flowers home, this newly anointed trash art expert decided to plants her flower within the installation. The larger-than-life installation by Claudia Borgna delighted and invited children to play in the wonderland she created. We couldn’t be happier with the huge turnout and enthusiasm. 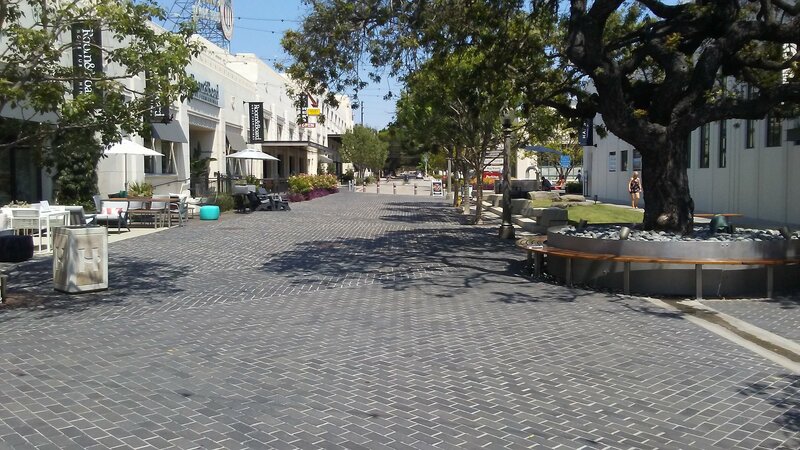 We would like to personally thank Angela Anthony, Communications Director of the Helms Bakery District, for the invitation to curate a Made Out of WHAT exhibition for the Culver City Art Walk and Roll Festival. We would also like to thank Claudia Borgna as well as all our artists and volunteers for enabling another successful event! Made Out of WHAT has curated a meandering exhibition down Helms Walk with a selection of work from around the globe made out of consumer and industrial waste: proof positive that old street signs, plastic bottles, used wine corks, and even street garbage can be transformed into beauty and utility. 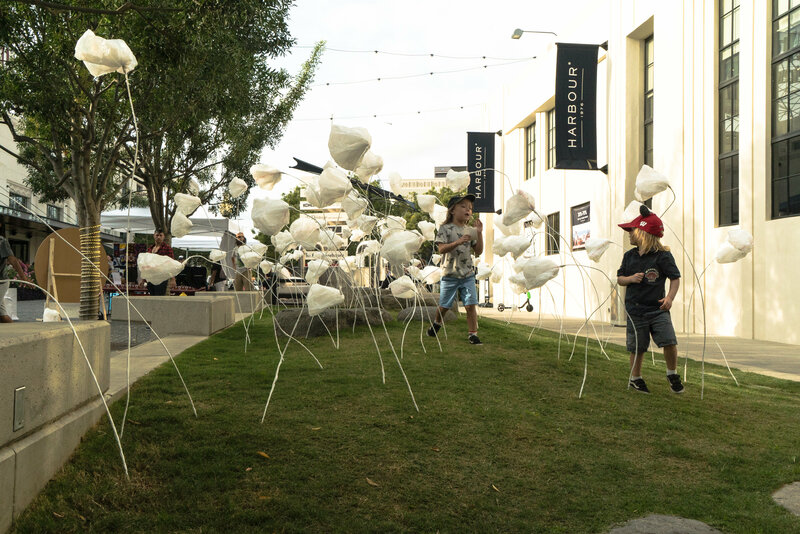 Join renowned international artist Claudia Borgna in constructing an interactive installation of recycled plastic bags on Helms Walk, offering a witty commentary on our mainstream consumer culture. 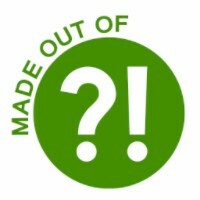 Come be surprised and inspired by the exhibition we curate here! TIPPING POINT: Love Letters, Portals and Rebellions.